Applications are now open for the Junior Zookeeper Leadership Program for the Summer of 2019! Update (4/11/19) : The first wave of acceptance e-mails has gone out. We e-mailed the acceptance notifications to the e-mail address(es) provided on the application. If you applied prior to 4/11/19 and have not yet seen your acceptance notification, please e-mail us. Further applicants will be notified in waves moving forward. The Junior Zookeeper leadership program is an excellent opportunity for youth, ages 11-14 or who have completed the 5th grade (whichever comes first), to gain valuable skills and memorable experiences during the summer at the Red River Zoo. The Junior Zookeeper Program focuses on instilling leadership, responsibility, and self-confidence in today’s youth, while also educating the participants about the Zoo’s mission of conservation and education. This program gives insight into many aspects of operating a modern zoo and highlights the various roles that are important to its smooth and efficient operation. Participants will have the opportunities to assist in animal care, create enrichment, educate the public, inspire conservation action, learn more about our animals, and help clean, prepare and maintain the zoo each day. The program will explore weekly themes on leadership, animal husbandry, conservation, and naturalistic interpretation. These themes are explored through team activities, responsibility for daily tasks and giving the participants creative ownership over several projects. Join us and experience summer at the zoo! *While the program is inclusive the youth are often exposed to loud and close quarter environments which sensory sensitive individuals may find overwhelming. Staff supervision is split between several groups and is not one-on-one. Please contact us with any questions regarding the accommodations we can provide. To be accepted into the program, please fill out the online application below. The application consists of registration information and a personal statement to be answered by the youth participant. Acceptance into the Junior Zookeeper Leadership program is not guaranteed. The program operates daily. Junior Zookeeper daily shifts are half days from 9:00am-1:00pm and from 1:00pm-5:00pm and Junior Zookeepers can attend up to 30 shifts per month. NEW for 2019 – We now offer a Red River Zoo member rate and a non-member rate for the program. Membership is no longer a requirement for participation in the program. 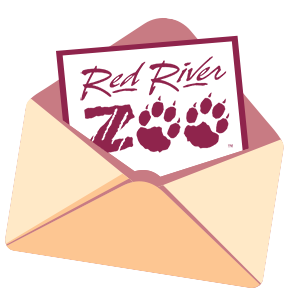 • Attend an Orientation – Orientations will take place at the Red River Zoo on Wednesday and Thursday, May 22nd & 23rd at the Red River Zoo. There will be two sessions both days at 6:00 pm & 7:30 pm. Seating is limited, so it is recommended to attend with one parent/guardian. The Junior Zookeeper program application can be completed using the link below. Click the button below to apply. If you have questions about the application process or regarding your submitted application, please e-mail us.